My natural hair is on the oily side, it is totally straight and very thin. I guess this is what makes it soft, shiny and naturally frizz-free. I blow dry my hair only on special occasions when I want some extra volume at my roots and I'm very moderate in using high temperature tools too. On a casual daily basis I only go for overnight curling techniques that do not involve heat and I believe this really helps to preserve my hair healthy. At the moment my hair is shoulder length, so whenever you see it long and thick, I'm wearing Glam Time clip-in hair extensions. In the following video I answer all frequently asked questions about hair extensions usage and care. Till recently my hair was bleached and toned every 5-6 weeks, and everyone kept on asking me how did I keep it in such a good condition despite all the strong chemicals and stuff. I have two answers to that. Finally, I found a colorist that knew how to use bleach lol. He started to bleach my hair with L'Oreal Blondys with 30 vol developer leaving it on my hair for 50 mins. This purple liquid worked magic compared to white powder bleach either from L'Oreal or Wella that was used on my hair before and never fully met my expectations. 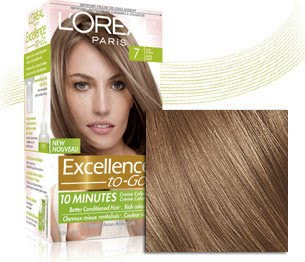 After bleaching, my hair was toned with L'Oreal toners, usually it's a mix of P0, P01 and P02. Two, my hair type. As I mentioned before, my hair is naturally quite oily and even though bleaching does dry it out to a certain extent, I quite like the texture that it gives to my hair. My natural hair is super smooth, silky and flat which makes it difficult to style, while bleached hair is rougher and appears fuller. 1. L'Oreal hair conditioner that comes with Récital Préférence hair dye. It's my mom who buys it, she doesn't need a conditioner, so she gives it to me. I madly love this product for the comfort of use and for the results it has on my hair. I wish it was possible to buy it separately from the hair dye, but unfortunately L'Oreal doesn't seem to hear my prayers. They have other products that I use (those listed below are quite good), but still not as good as this one. 2. Shu Uemura Full Shimmer hair mask is super expensive (twice cheaper is you buy it online!) but probably it's the best product I ever tried along with (1). 3. L'Oreal Ever Strong hair mask. This one is one of my most recent discoveries and surprisingly I'm more happy with this product than with most professional ones. 4. L'Oreal Force Vector hair mask. 5. John Frieda Sheer Blonde conditioner for lightest blondes. I don't see how it affects my color, but I quite like the texture of this product. To get the best effect from these products, you can apply them on your towel dried hair and cover your head with a shower cap and then with a towel. Wait for ~1 hour, and once you rinse your hair afterwards, it should be super soft and smooth. Whenever I do it, I just cannot stop touching my hair lol Though I don't do it too often, otherwise my hair is too flat and difficult to style. 1. Wella SP Volumagic. This product is my No.1 Must-Have. I apply it on towel-dried hair and then blow dry my hair with my head upside down. This gives an incredible lift to my roots and a perfect texture for styling. I just love how it gives the feeling of volume and thickness without overloading my hair. 2. Schwarzkopf Professional BC Bonacure Volume Boost Volume Lotion. I use it just like Wella SP Volumagic and it also gives fantastic results. 1. Schwarzkopf Got2B Happy hour. Hope this info helps, and do let me know what are your favorite products and hair tips in the comments below!